I was informed about Newton Meeting for Worship through Michael Romano. He was a coordinator of the Food Not Bombs program. 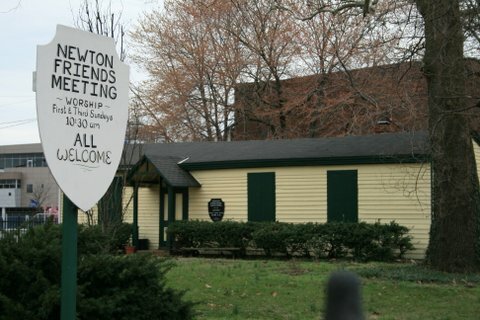 The program has permission from Newton Meeting to use their premises to cook delicious vegetarian meals for Camden’s indigent population and serve them, where they are, on the streets. Michael Romano and I had been through similar hard knocks in our own lives and shared similar philosophies about religion and outreach for Camden. He said he was Quaker told me about Newton Friends in Camden. I knew I needed to go to visit as soon as possible. I was feeling disappointed with the top-down methodology at the church I was attending. It wasn’t a right fit for me anymore. I didn’t desire to worship through this methodology anymore. God’s words for me, was different from what I was repeating in church. When I went to Newton Meeting for the first time the garden was starting to bloom. Sunflowers stretched out to the sky, ripening tomatoes hung on vines; there was an actual fig tree… I was soaking in all this beauty. At Newton, the beauty I saw around me matched the feelings I experienced working with children and adults in Camden. A man in jeans and checked shirt, God depicted by Michelangelo, met me as I walked around the property. He was obviously the gardener, later I learned he was the property clerk. He showed me the children’s garden, and the Saturday program garden, all cared for by this property clerk, and various Camden residents. Here was God in action. At 10:30 I went in for the meeting. It was a small building with pictures of Lucretia Mott and Sojourner Truth over a fireplace. Wooden pews were placed in a circle. The antiquity of this building was palpable and filled me with an intense feeling of stepping back in time. William Penn could have sat in one of these pews. There were approximately 6 people at this meeting, some older, some younger. We sat in silence. I was used to meditation and had been to a retreat years ago at Pendle Hill, so I thought I knew what to expect from a Quaker worship meeting. What I did not expect was a testimony that moved me to tears, not from a church authority sanctioned to speak at me, but a sharing of God working in an equal’s life. This testimony was from an older man, white hair pulled back into a ponytail, dress clothes and a head band, like I had worn in my “Hippy” days. He shared about a family vacation to a farm in Michigan where he grew up. He shared that the tree that he watched his grandson play in, was the same tree he had played in when he was a child. He spoke of how the love of nature, fostered by the relationship to this landscape, will continue from generation to generation. When there was silence again, from within me came the words “La’dor vador,” which is a Hebrew for, “from generation to generation.” The song of that same title with all its meaning resounded in me and I was with that spontaneous prayer. It wasn’t even a Holiday. In English, “From generation to generation… your miracles give us reason to live. From generation to generation… Passing down what’s been passed down to me makes my life complete.” Within, I was led to my own worship surrounded by others going where their stillness took them. When the meeting for worship came to a close, I was welcomed, heard and seen by everyone. The gathering was small enough not to be overwhelming. I felt like was visiting a family. Being with this small group of independent seekers, in this ancient space, with growth surrounding me, inspired by testimonies, gives me the freedom to be still and let God speak to me. Sometimes I listen to inspiration from an equal and follow where I’m lead in silence. Other times I am inspired by where I’m lead, and share as an equal. "Very warm and welcoming. I loved the light and airy feel of the meetinghouse." "Meeting for worship was centered. The vocal ministry felt inspired and was humbly delivered. The children worshiped with us for about 20 minutes and they were relaxed and still--I could tell they were seasoned little worshipers. It was good to be part of a larger nunber of worshipers than my home meeting can produce. It was also good to hear many sharings during the Joys & Concerns period at the end of meeting." This is an online giving program site set up through Philadelphia Yearly Meeting. If you wish to donate to Newton Monthly Meeting, you may do so here in order to support the Meeting in its continued community efforts. Philadelphia Yearly Meeting is a community of over 100 Quaker meetings and thousands of Friends in a four-state region who live our faith each day.